Aside from the risks of blasting, the threat to endangered and rare species, the potential for a natural gas leak or explosion, the possible disruption of Native American burial grounds, and the fragmentation of wildlife habitats and stream buffers because of clearcutting, the Atlantic Coast Pipeline has another problem: Its construction and maintenance could contaminate eastern North Carolina’s drinking water. 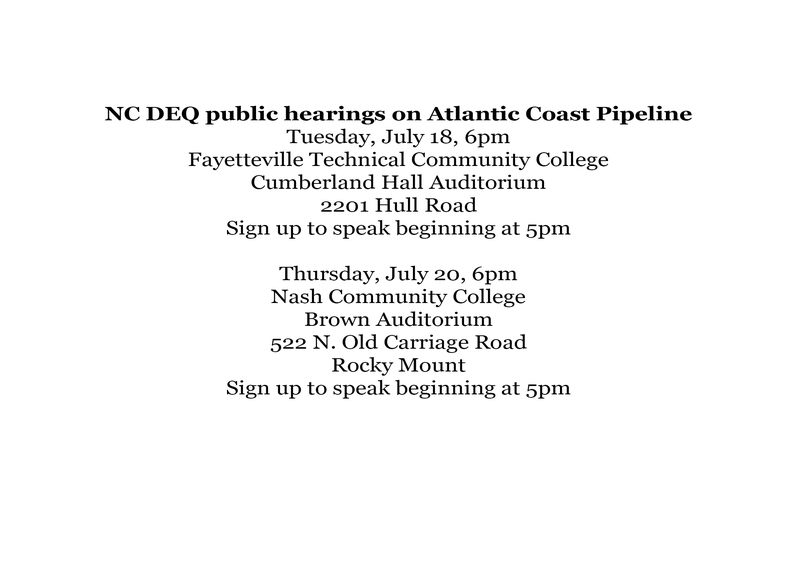 The ACP’s impact on water quality and riparian buffers — which help protect rivers, lakes and streams — are the topic of two public hearings this week, sponsored by the NC Department of Environmental Quality. And on Friday, FERC will issue its final environmental impact statement on the pipeline. Co-owned by Dominion Energy and Duke Energy, the $5 billion, 600-mile natural gas pipeline would begin at a fracking operation in West Virginia and route through Virginia. Then the 3-foot diameter pipeline would enter North Carolina in Northampton County and continue more than 180 miles through eight counties in eastern and southern parts of the state: Northampton, Halifax, Nash, Wilson, Johnston, Sampson, Cumberland and Robeson. In Robeson County, the ACP will connect with a line owned by Piedmont and continue through Richmond County and on to South Carolina. As NCPW reported in February, the draft EIS explained some, but not all, of the environmental damage caused by pipeline construction and maintenance. The ACP would upend 419 acres of wetlands during construction and 144 acres permanently. As the pipeline is built, which would entail blasting, drilling and trenching, contractors would have to remove swaths of trees and pine scrub along swamps and stream banks, displacing wildlife. The pipeline would burrow beneath six major rivers and 34 water bodies in total. Among these are sources of drinking water for hundreds of thousands of people. In its comments to FERC, the EPA warned that open-cut trenching — essentially digging out part of the Neuse River for a pipeline crossing — could “impact public and private drinking water sources.” The agency advised that Dominion and Duke should compile a comprehensive database of all public and private sources downstream. The US Office of Environmental Policy and Compliance, which is under the Department of the Interior, noted that two towns have drinking water intakes within five miles downstream of the pipeline route: Rocky Mount and Wilson. In Virginia, there are concerns that disturbing river and stream beds could release mercury that has settled in the sediment downstream from an earlier mercury spill. While a similar scenario in North Carolina was not part of the comments, one waterway near the pipeline route has elevated levels of mercury: a part of Locks Creek, northeast of Fayetteville, is on the federal impaired waters list for mercury. However, these assertions aren’t completely true. An estimated 18 permanent jobs will be created by the pipeline. Natural gas does burn cleaner than coal, but that doesn’t make it clean.Methane leaks from fracking operations are major contributors to greenhouse gases and climate change. It is still uncertain how much of the gas will remain in North Carolina and how much will stay in Virginia or even flow to South Carolina and points beyond. And if the pipeline route is, as the Chamber asserts, “the result of years of comprehensive studies and surveys to avoid and minimize environmental impacts to sensitive areas,” then it’s puzzling why federal agencies and scientists have harshly criticized the draft EIS for its lack of information. Also as expected, major environmental advocacy groups, including the Sierra Club, Clean Water for North Carolina, the Southern Environmental Law Center. the Blue Ridge Environmental Defense League, and the NC Coastal Federation all oppose the pipeline. 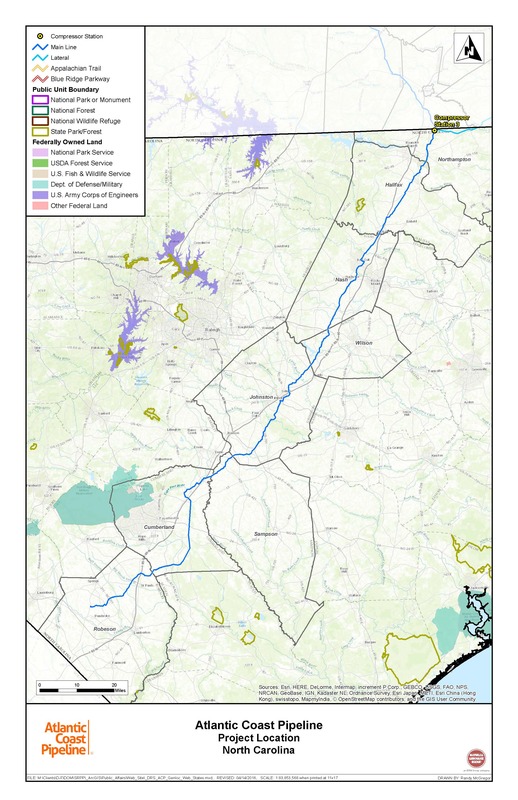 Clean Water for North Carolina, which has long been working with communities along the route, quoted from the Institute for Environmental Economics that there is currently “an overbuilding of natural gas pipelines.” Since 2010, Pipeline and Hazardous Materials Safety Administration data show that the number of “significant incidents” involving pipelines has increased by five times. This indicates “a rush to build,” CWFNC said. Even though the pipeline route would run through many low-income and minority communities, including Native American lands, the draft EIS concluded there are no environmental justice issues associated with the project. The NC Commission of Indiana Affairs disagreed, noting that nearly 30,000 Native Americans live in the census blocks that the pipeline passes through. This is equivalent to a quarter of Native Americans living in North Carolina. Many tribes, including the Coharrie and the Lumbee, commented that FERC had not adequately communicated or engaged them throughout the process. If FERC approves the pipeline — and the commission rarely denies such projects — it would have to clear several state permitting processes in the divisions of water resources, air quality, and energy, land and mineral resources. In some cases, the US Army Corps of Engineers would also have to approve the permits.